Following our performance at the Bedford Christmas Tree Festival we were approached to support Bedfordshire Fire and Rescue Sevice’s annual Christingle Christmas Celebration at Woburn Parish Church on Thursday 20th December. The service gives everyone in the Service, except those who cannot be released from operational duty, the opportunity to come together, with friends, families and the communities we serve to celebrate Christmas. The Reverend Stephen Nuth hosted and conducted the service this year with the Bishop of Bedford Richard Atkinson. Together with the Stotfold Salvation Army Band we led congregation carols and also performed two pieces during the service. A collection was taken in aid of The Fire Fighters Charity and Woburn Parish Church. Photos can be seen from the event here in the album on our Facebook Page. We returned to Upper Caldecotte with the Northill Community Choir for a joint Christmas Concert this year. Whereas previous concerts have been earlier in the month, this year we performed on 15th December. All concert proceeds were split between charities. This year the weather was kind and we were able to perform at the Bedford Christmas Tree Festival at St Paul’s Church on Sunday 9th December. Unfortunately we were without our MD, Simon Berridge who was busy performing with The Sixteen. Thanks goes to Charles for playing the piano and to Liz R for leading. Some fantastic photos were kindly taken by Ian Whiting of the Bedford Camera Club and can be seen on our Gallery page. We were pleased to return to Milton Ernest Hall to entertain residents and visitors to their annual Christmas Fair on the afternoon of Saturday 8th December. 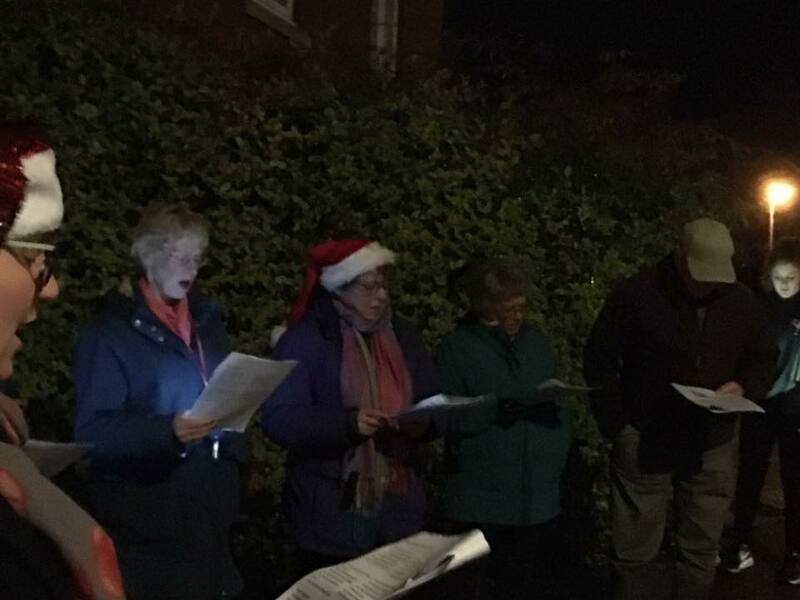 On 5th December, Kate, Liz C, Sally and Janet T represented The Moonlighters to help lead and support charity carolling in Bromham in aid of the Elisabeth Curtis Centre. The Centre is part of Riding for the Disabled. Together with a quartet from the Bedford Town Band, volunteers from the Centre and local residents from the Parkland estate, a merry band serenaded carols up and down the local roads while a collection took place from door to door. We were delighted to join other choirs to perform at Wimpole Hall as part of their Georgian Christmas celebrations this year. 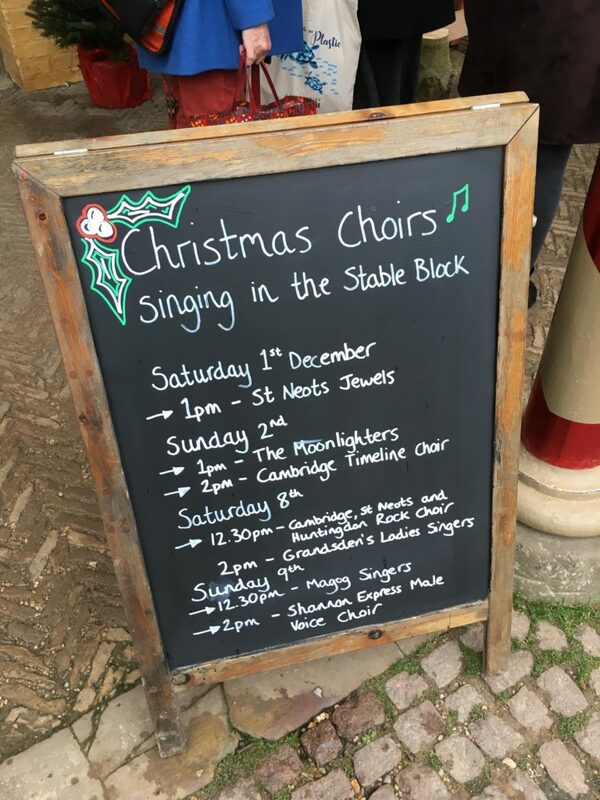 On Saturday 2nd December we performed to visitors in the stable block area, which although windy, provided a pleasing acoustic. More details for these engagements can be found on our Facebook page. We are pleased to continue our friendship with the Northill Community Choir and perform a joint summer concert on Saturday 14th July 2018 at All Saints Church, Upper Caldecotte. There will be a variety of things to please your ears, choral and instrumental. A mix of songs from both choirs and some soloists too. Plenty of laughter along the way. All finished with lovely cake. Tickets £5 on the door, proceeds to local charities. On the 10th December 2017 we were due to perform at Langslade House in Bedford for the residents, but the weather prevented us getting there on the day. We were very glad to rearrange to sing a spring programme to the residents on April 29th 2018. Thank you so much to all who came to our Christmas Concert in Biggleswade on 20th December. It was lovely to see so many of you there to share in our seasonal celebrations, especially to other local singers who joined the audience. We were also pleased to perform the limited edition 2017 Christmas Card piece by Charles Evans, a local composer and member of the Moonlighters. We were very pleased to partner with the Northill Community Choir again on Saturday 2nd December 2017 and perform a Christmas Concert at Upper Caldecotte. We performed The Evening Primrose, O Christmas Tree, Away in a Manger and The Goslings. We also joined in with some of the Northill numbers. We are pleased to invite you to join us for our Christmas Concert and Social on Wednesday 20th December 2017 7:30pm at the Footprints Room, Trinity Methodist Church, Shortmead Street, Biggleswade. There will be songs, carols, light refreshments, chat and friendship. EDIT: Sadly our engagements on 10th December were cancelled due to inclement weather. We hope to rearrange and perform at the Christmas Tree festival and Langslade House in 2018. On Saturday 23rd September 2017 – we were pleased to perform on the open air stage at St Andrew’s Church Country Fayre in Biggleswade. Following our appointment of Simon Berridge as our new musical director, we were pleased to perform our first joint summer concert with the Northill Community Choir, which Simon also directs. Come join us on Saturday 8th July at All Saints Church, Upper Caldecotte, Bedfordshire. The programme will be a variety of things to please your ears from Byrd to jive and gospel. A mix of songs from both choirs and some soloists too. The concert will finish with some lovely cake. £5 tickets on the doors, proceeds to local charities. This was a marvelous opportunity for us to join with St Paul’s Church Choir and Kongsberg Kantori, a visiting Norwegian group. Although much of the programme consisted of Bach, we sang three spirituals in the middle of the evening, Didn’t it Rain, Ev’ry time I feel the Spirit and Steal Away. At the end we all took part in Immortal Bach, a variation by Knut Nystedt involving an amazing creation of sound. 8th May St Andrews Church in Biggleswade – Spring concert combined with Harmony Youth Choir. The audience was largely made up of humans rather than dogs who were appreciative of our offerings despite the fact that we had to perform without a musical director. Several other groups were taking part which meant that we were entertained too. A community choir, a barbershop quartet a ukulele band and us! The golden oldies came out that night such as Chattanooga Choo Choo, Under the Boardwalk, It Don’t mean a Thing and Java Jive. Since there were only five ladies able to perform, we found a different selection of non-Christmas and Christmas songs and carols. These included Jamaica Farewell, Do you hear what I hear? and The Little Road to Bethlehem. As always, we received a warm welcome from the residents and staff. 16th December St Andrew’s Rooms, Biggleswade. A Christmas entertainment for the Sandy Masonic Lodge. We rounded off the year with our third visit to the Sandy Lodge. We sang fairly traditional carols as requested but included Twelve Days After Christmas and But Once a Year, another of Charles’ compositions. As last year, we returned to sing for the Ladybirds group in Gamlingay, Milton Ernest Nursing Home and the Sandye Masonic Lodge. It was lovely to be invited back by all three groups and to share their Christmas celebrations. We did not share a warm-up location with the fire engine in Gamlingay this year but were warmly welcomed. Many more friends and family joined in with residents at Milton Ernest and the Masons participated energetically once again. This venue provided us with a different but very enthusiastic audience. This was despite the fact that the lift was not working so that the piano and most of the residents were separated by a whole floor and an extremely long corridor! However we were able to perform a variety of songs including Fair Phyllis, Dashing Away with the Smoothing Iron, Let’s Do It and Only You. Please ‘like us’ on Facebook, and receive updates from the choir as well as event invitations to hear us sing. A unique evening combining Music and Geography. The evening’s programme, to mark the 50th anniversary of the Bedford Geographical Association, included songs linked to geographic themes; Bedford (and some of its famous residents); and what was popular in music 50 years ago. The evening will included performances from the Bedford School Dance Band, Gabrielle Bell, Rex Walford and the Moonlighters. as well as old favourites from the Glen Miller era.